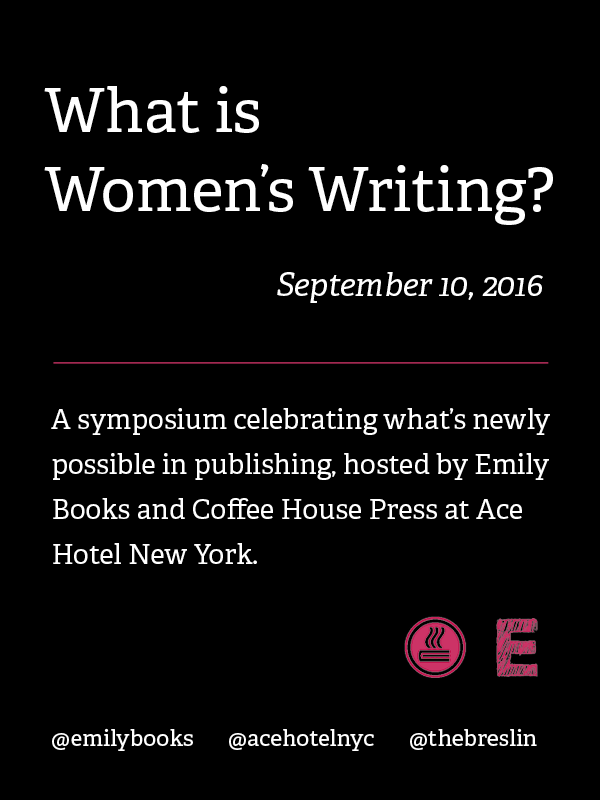 Join us at Ace Hotel’s Liberty Hall on September 10 for the first Emily Books Symposium: What is Women’s Writing? You can buy your ticket—which gets you access to the full afternoon of programming, plus a free drink at the party that follows—at the bottom of this page. To celebrate the launch of our new Coffee House Press imprint, we’re investigating what “women’s writing” means at this moment in history. What’s exciting and different about the new novels that are shaping our culture? How can we rewrite the canon to include the non-male voices that have shaped us? Why has it taken so long for honest, unvarnished depictions of women’s subjectivity to take center stage in literary fiction? What is the next barrier to break down, and how will we do it? We’ll talk about all this and more as editors Caroline Casey (CHP), Laia Garcia (Lenny Letter), Megan Lynch (Ecco), agent Mel Flashman and National Book Foundation executive director Lisa Lucas sit down for a panel discussion with Emily and Ruth, to answer the question what is women’s writing? Next we’ll get to hear some of our favorite Emily Books authors and friends read! Eileen Myles, Elisa Albert, Ariana Reines, Barbara Browning, Charlotte Shane and Natasha Stagg. Then, after a quick break to look at books, we’re obviously having a party with special appearances by Jade Sharma and Chloe Caldwell. Entry to the party is free, but you’ll need a ticket for the panel and readings. 4:30-5:45pm (doors at 4:00): What is Women’s Writing? A panel discussion with editors Caroline Casey (CHP), Laia Garcia (Lenny Letter), Megan Lynch (Ecco), agent Mel Flashman and National Book Foundation executive director Lisa Lucas, moderated by Emily Gould and Ruth Curry. 6-7pm: Readings from Eileen Myles, Elisa Albert, Ariana Reines, Barbara Browning, Charlotte Shane, and Natasha Stagg. 8pm: A party to celebrate five years of Emily Books, with special appearances by Jade Sharma and Chloe Caldwell (free). One ticket gets you into both the panel and the author talks: you do not need a ticket to attend the party. Entrance to the party is free! Ticket-holders, the party may get busy, so show up in the first hour and we will guarantee your entry and give you a free drink.